Nora E. Griffin, 82, passed away Dec. 12, 2017, at her Ordway home. She was born Oct. 5, 1935, in Colorado Springs, Colo., to Roy B. and Lois (Baber) Hamilton. Nora married W.C. Griffin on Dec. 4, 1955, in a country church in Elbert County; he preceded her in death on Dec. 29, 2002. Nora graduated from Elizabeth High School, as a part of the class of 1953, and worked at George McClellen Super Market during high school, where she met her future husband. She worked as a Denver wholesale florist as a florist tech. for 15 to 20 years, was a safety inspector director with Refrigerated Foods Transport, Inc., parts manager at Car Quest in Elizabeth, Colo., helped run and milk cows at R3 Dairy in Ordway, and was a longtime librarian at Crowley County School District. 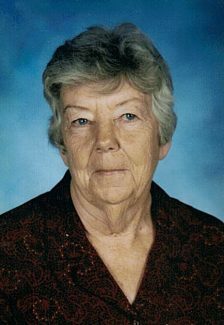 She graduated from Otero Junior College with a degree in ranch management in 2005 at the age of 70. Nora played basketball, enjoyed reading, being a 4-H leader and a member of the Western Dairy Association. She was the runner-up Elbert County Fair Queen in 1961 and had a commercial drivers license. Nora is survived by her son, Robert Griffin; granddaughter, Rebecca Griffin; great-grandson, Andy Garcia; grandsons, Calvin Griffin and Clint (Shawnee) Griffin; great-granddaughter, Shae Griffin; son, William Griffin; grandson, James (Tracy) Griffin; great-grandsons, Stetson and AJ Griffin; great-granddaughter, Jessica Heil; great-grandson, Christopher Heil; sister, Suzie (Don) Graeff and many nieces and nephews. She was preceded in death by her parents, husband, William Griffin, five sisters-in-law and her uncle, Keith Baber. A celebration of life service was held Dec. 18, 2017, at the Ordway United Methodist Church with Reverend Keith Hudiburg officiating. Online condolences may be made at http://www.PeacockFH.com. Peacock-Larsen Funeral Home and Arkansas Valley Crematory is in charge of arrangements.